Don't get me wrong: there are options to put equations on a computer. Most computers have at least Equation Editor if not MathType. Scholarly papers in mathematics often use LaTeX and it's also possible to blog LaTeX equations using Wordpress. 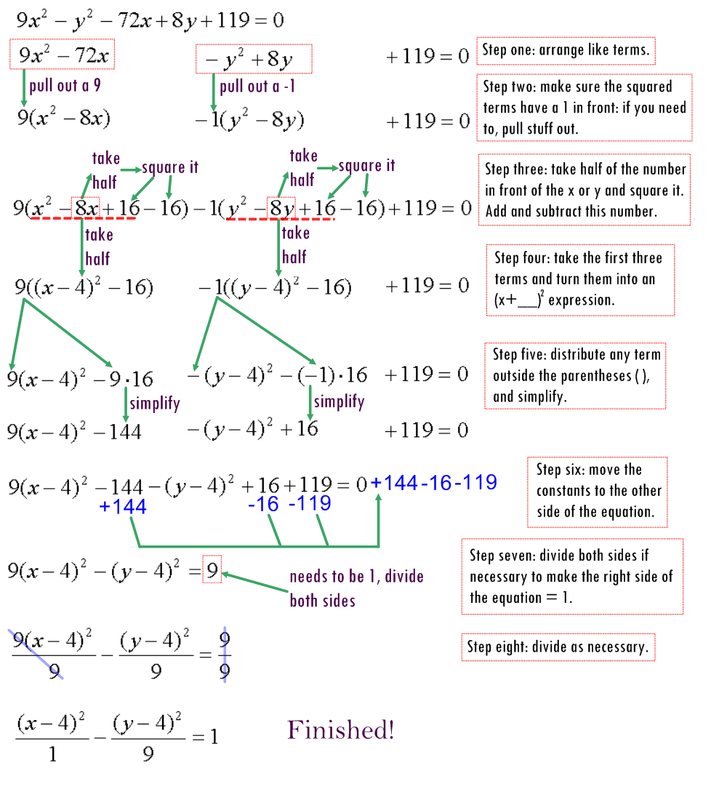 I have used these before (my Pre-Calculus students are currently working on blog posts with LaTeX equations) and they are fine in their own context. However, I consider these typesetting solutions. What I mean is most closely analogous to the difference between a word processor and a desktop publisher. In a word processor the text can be played with, experimented with, refurbished and remodeled in a manner easier than even pencil and paper. The layout of the text, however, is secondary. With a desktop publisher the placement of text is key, or at least a distraction to a student still trying to figure out their sentences need verbs. In the course of a normal math class, parts of equations need to be crossed out, circled, arrowed, underlined, and spaced out. When I laid out my solution to a general conic, I couldn't use just an equation editor; I had to manipulate the parts in an image editor. To put it another way, it's difficult to think the equations directly to the computer screen; sometimes I have to work things out on paper first and then translate them visually. That's hardly conducive to a live collaboration. It's certainly still possible, but the pragmatic teacher has to ask if the loss of fluidity is worth the gain of remote interaction. There are ways with technology to translate writing directly to digital form; on a SMART Board or a digital writing device. Some teachers will upload their SMART Board presentation to the Internet immediately after class, including any writing that happened. If anyone has done a particular lesson with these tools, feel free to share your ideas. The ideal would be for the word processing equivalent of an equation editor. I'm not sure how that'd work; somehow it have to include the crossing out, circling, arrows and so forth we have students do in an entirely natural manner. There wouldn't just be the ability just to write equations line by line as in a textbook, but to drop a single row and move a variable by using the inverse without any worry of typesetting. Take a look at my general conics example again; if that sort of layout could be done easily, with just natural typing, mathematics teachers would flock to your door.